Comprehensive eye exams, also known as routine eye exams, are a preventative measure to the early diagnosis and treatment of eye and vision problems. When scheduling your appointment, be sure to tell us if you are seeking glasses or contact lens. 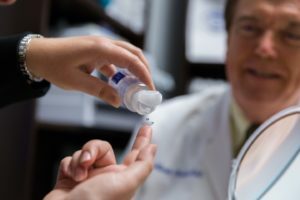 A contact lens exam may require additional testing to ensure the correct fit of your contact lens. Our staff will also demonstrate the proper technique to placing a contact in your eye and how to safely remove it. We provide you with the convenience of ordering your glasses and contact lenses at the end of your appointment right here in our office! Our optical shop, located in the reception area of both office locations, offers a large variety of frames and lenses to best fit your needs. You can even bring in an outside prescription to our optical shop! Comprehensive eye exams are typically once a year, however this can vary greatly depending on the individual’s age, race, history, and symptoms. Those with no vision problems or very low risk of developing eye diseases may only need to come once every couple of years. Please consult your doctor on the best plan for your routine eye exams.